Many people on the web have been complaining about the lack of online media engagement and information output by J.League clubs, and soon the assumption was made that J.League clubs do not interact with fans and followers as much as other clubs. Especially, European clubs such as Juventus, Borussia Dortmund etc. seem to do a great job in interacting with fans on Twitter or Facebook in multiple languages. This made me curious and I decided to compare three clubs that are surrounded by similar circumstances, but operate in different leagues, markets, cultures, and continents. My choices fell on FC Tokyo (Japan), Monterrey Rayados (Mexico), and FC Spartak Moscow (Russia). You can read my comparison in the following paper. I would appreciate all your comments that state your opinion on the outcome of the comparison. Click here, if you cannot see the embedded window. Football is a global phenomenon that can be enjoyed without geographical boundaries. Clubs anywhere in the world entertain audiences in stadiums, on TV, and through different products, and try to spread their brand while interacting with people of interest on online channels. Some clubs do it more effectively than others and can therefore provide more fertile ground for their brand to engage fans and prospective customers (Brown et al., 2007). Certain clubs enjoy the loyalty of legions of fans in one part of the world, whereas they are rather unknown in other regions. Furthermore, it seems obvious that in the 21st century, fans and followers are organized through social media platform such as Facebook to overcome geographical barriers (Zhang, 2010). However, without proper incentives by the club, social media can only provide limited possible interaction and flow of information. Professional football clubs outside of Japan are more engaged in interactions with fans and followers, because they use social media channels more effectively. In order to compare three clubs operating in similar circumstances, clubs from countries with a similar size in population and GDP need to be chosen. After consulting a list of countries ranked by population (Wikipedia, 2013) clubs from Russia, Japan and Mexico with country populations of 143 million (Russia), 127 million (Japan) and 112 million (Mexico) respectively were chosen. The countries are ranked 9th (Russia), 10th (Japan), and 11th (Mexico). The above-mentioned countries were ranked 3rd (Japan), 10th (Russia) and 14th (Mexico) in terms of GDP by the United Nations (2012), which can be a relative measure that football fans and consumers in general have similar possibilities to access and enjoy football in their respective countries. The FIFA/Coca-Cola World Ranking was not considered for this research, since the ranking focuses on national teams and is an irrelevant factor for this comparison. The comparison requires a club to be competing in a top-tier division since 2012 to make sure all clubs receive the maximum amount of football advertising and promotion in their home market. In addition, a club is required to use Facebook, Twitter and YouTube as online communication platforms in their domestic language to qualify for the comparison. The choice fell on the above-mentioned platforms, because Facebook and Twitter are the most populous social networks as of March 2013 (eBizMBA, 2013) and easily accessible in many countries. YouTube is considered to be a must-use platform for any organization publishing information. Statistics show that YouTube reaches traffic of 4 billion views per day (Perez, 2012), which proves that the platform can bring a lot of weight to the online communication mix of an organization. The other requirements were chosen randomly for guidance. Choices for the three clubs were made randomly after visiting official club websites and other online sources. After scanning various online sources the conclusion could be drawn that many J.League teams lack engagement in above-mentioned social media platforms. This made it impossible to choose one of the more popular and successful J.League clubs for this research. Therefore, the choice fell on a club that has never won the J.League’s Division 1 championship and only participated in the AFC Champions League once in their professional career: FC Tokyo. However, due to the location of the club and the fact that their average attendance in their home stadium has been counting more than 22,000 people per match since 2001, except for 2011 when the club was relegated to J.League Division 2, these might give some extra leverage to the possibility of communication with their fans and followers. More teams in Russia and Mexico met all the set requirements for this research. Japan seems to lag in total social media participation (Delo, 2012), whereas Russian and Mexican clubs seem to be more open towards new media. All engagement figures were gathered until 25 March 2013 8:00 PM Central European Time (CET) for Facebook and YouTube, and 6:40 PM CET for Twitter respectively and were analyzed for the period 15 to 25 March 2013. Four (4) metrics were chosen to evaluate the social marketing reach and personal involvement with Facebook fans in conversations: posts by the official club fan page, likes, comments, and shares (Munn, 2013). All figures were gathered separately for a more accurate analysis. The nature of the content of the posts (picture, video, advertizing, etc.) and its quality were not considered. The metric for the level of engagement on Twitter is of different nature than the one for Facebook. Instead of measuring the engagement level of the fans towards the club, the research on Twitter wants to gather information of how the clubs engage with their followers. The reason is based on time constraints for this research and the accessibility of the necessary data. To measure the engagement performance of the clubs with followers on Twitter, three (3) metrics with outbound characteristics were chosen: retweets by the official club account, mentions of other Twitter accounts in tweets, and replies by the club account to tweets by others. It is essential for a brand to listen to the community and respond with useful and relevant content (Wilson, 2013). All figures (for retweets, mentions, and replies) were summed up in one number, since any kind of engagement on Twitter is presented very similar format in any tweet. Hence, creating one figure that aggregates the level of engagement is the right thing to do in the case of Twitter. YouTube does not provide easy access to the amount of likes and comments of videos in the form of a list. Videos have to be accessed individually, which would have made the workload for this research unbearable in regard to the time constraint. Therefore, the assessment of the engagement level was restricted to likes and comments of the three (3) most popular videos of each club’s individual YouTube channel. For this research the following three factors were not considered: dislikes, date of upload of the videos, and possible geographic restrictions. Communication through online channels is essential to keep fans and followers involved with a brand and make sure valuable information is spread across different media channels (Scarborough, 2013). The most popular social media channels today are Facebook and Twitter with estimated 750 million unique visitors per month in the case of Facebook and 250 million unique visitors per month on Twitter (eBizMBA, 2013). Furthermore, these social networks are easily accessible in different countries and offer easy access through mobile devices. YouTube, currently being the second-largest search engine on the web, after Google, (Kostalampros, 2013) is another online communication channel, which successful organizations cannot do without (Thaw, 2007). Even though the platform is not necessarily used as a social network by brands, the embedding option gives YouTube videos an ultimate viral potential, which is essential for any brand that wants to spread its audio-visual content throughout the Internet (Lewis, 2013). A closer look at the Facebook behavior of our three reference clubs and their fans shows that FC Spartak Moscow accumulated 469,219 page likes until 25 March 2013, followed by Monterrey Rayados with 213,220 likes, and FC Tokyo far behind both of them with 9,234 likes. However, one factor that was not considered here is when exactly the Facebook fan page for each football club was started. This could have a certain impact on the accumulation of likes, but is not of importance for this research, since the focus of the research lies with the engagement level of the respective channels in the time-span of 10 days. Posts published by the administrator of a Facebook fan page are a crucial marketing communications instrument and the life and blood of a fan page. The right balance between information, entertainment, and education needs to be found for the best possible user experience (Selwyn, 2009). From the clubs chosen for this research Monterrey Rayados published the most posts within our given time-span with 185 out of an accumulated 220 posts across all three clubs. The number equates to 84 percent of all posts published between the three clubs. FC Spartak Moscow posted 21 posts (10 percent) and FC Tokyo 14 posts (6 percent). Facebook offers the possibility to like published posts. The 213,220 fans of the Monterrey Rayados Facebook fan page showed most engagement by clicking 116,060 times on a like button on a post. That equates to 96.25 percent of all likes given to the three analyzed fan pages, given that the sum of all likes amounts to 120,588. The 469,219 fans of the FC Spartak Moscow fan page liked the clubs posts 3,149 times, which translates to 2.6 percent of the whole; and the engagement of FC Tokyo’s 9,234 fans reached 1.14 percent, or 1,379 likes. Another way how fans can engage with the club’s Facebook fan page is by commenting on posts. Monterrey Rayados were able to generate 9,060 comments over the 10 days of this research. This figure translates to 96.43 percent of the 9,395 comments in aggregate written to the three club fan pages under analysis. FC Spartak Moscow received 328 comments (3.49 percent) by their fans and FC Tokyo was able to bring fans to comment 7 times (0.07 percent). Facebook offers users the option to share posts with their friends, and it is in any fan page administrator’s interest to have their posts shared and spread across Facebook to generate more likes, traffic and any other kind of engagement (Mustonen, 2009). As it was shown in the case of likes on posts and comments, fans of Monterrey Rayados shared most posts with their friends on Facebook. The total amount of shares across all clubs is 9,113 and Monterrey fans shared 8,948 (98.19 percent) of all posts. FC Spartak Moscow was able to motivate its fans to share 161 posts (1.77 percent) and FC Tokyo merely clicked 4 times on the share button, which equates to 0.04 percent of all posts shared. The figures gathered in Facebook for this research show that a higher amount of fan page likes does not translate into a higher engagement with fans, in this case. The Facebook fan page of FC Spartak Moscow sports 469,219 likes, which equate to 67.84 percent between the three clubs, but fan engagement in regard to likes of posts, comments and shares are considerably lower than the engagement of fans of the Monterey Rayados Facebook fan page, who amount to 213,220 fans, or 30.83 percent between the three clubs. With less than half of the amount of likes of FC Spartak Moscow, Monterrey Rayados are able to lead the ranking with 96.25 percent of likes received on all 220 posts across the three reference clubs, 96.43 percent of comments received on posts, and 98.19 percent of all shared posts. There is no correlation between the fan page likes and the engagement in this comparison. FC Spartak Moscow owns 67.84 percent of the 691,673 likes in aggregate, but their likes on posts, comments and shares only reached and engagement of 2.61, 3.49 and 1.77 percent respectively. On the other hand, Monterrey Rayados reached an engagement of more than 96 percent in all metrics with a mere 30.84 percent of likes. This proves to be strongly efficient, since Monterrey Rayados published 84 percent of all posts, compared to the 10 percent of FC Spartak Moscow and 6 percent of FC Tokyo. The Russian and Japanese club spent less resources in the publishing of the posts, but when compared to their outcomes the resources were wasted, since ineffectively used. FC Tokyo published 14 posts (6 percent of the whole sum) and generated only 1.14 percent of the likes on posts, 0.07 percent comments, and 0.04 percent of all shares. A possible correlation can be found between the amount of posts published by a Facebook fan page and the fan engagement. In this comparison, the more posts are published on a page, the higher the engagement of fans. Therefore, more opportunity for engagement should be created, if higher engagement rates are to be attained. One might argue that too much posting might upset fans. Nonetheless, it proved to be the right strategy in the case of this research. The previous section portrayed FC Spartak Moscow as the club with the most Facebook fans, but with a relatively low level of engagement on the social network in comparison to their Mexican counterpart, Monterrey Rayados. 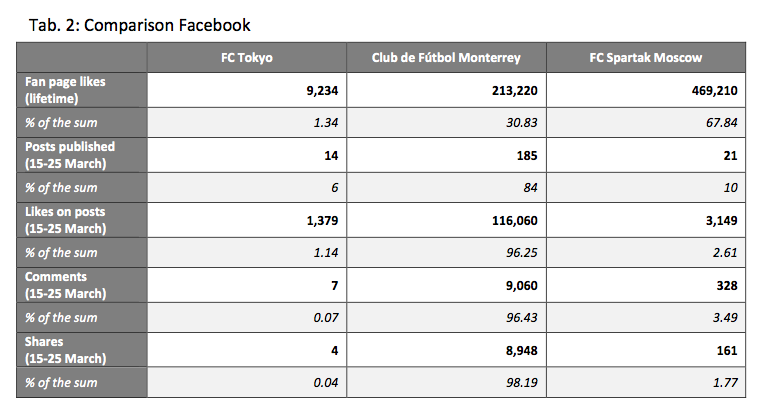 FC Tokyo has an irrelevant level of engagement on Facebook compared to the other two clubs. The analysis on Twitter shows that Monterrey Rayados have 196,159 followers, which translates to 55.97 percent of followers across the three clubs. The official Twitter account of FC Spartak Moscow is followed by 106,930 users (30.51 percent) and FC Tokyo has a following of 47,386 users, which equates to 13.52 percent. The three clubs tweeted a 264 tweets in aggregate in the time period 15 to 25 March 2013, with Monterrey tweeting 164 times (62.12 percent), FC Spartak Moscow sending out 90 tweets (34.09 percent), and FC Tokyo pushing out 10 messages (3.79 percent). The engagement level in this case is measured differently than in the previous section. Instead of measuring the engagement of fans with a club’s official channel, as done in the Facebook analysis, this Twitter analysis gathered data on how the three reference clubs engage with their followers. The engagement figure includes all outbound retweets, mentions and replies—multiple mentions in one tweet count as one (1)—by the club to the Twitter platform in the above-mentioned time period. Monterrey Rayados are the most interacting club in this Twitter comparison with 120 engaging tweets, which translate to 79.47 percent of the 151 times one of the three clubs engaged in a conversation on Twitter. FC Spartak Moscow engaged 31 times (20.53 percent) and FC Tokyo did not engage with anyone (0 percent) in said time period. Twitter is a social network that relies on connections and engagement to foster relationships and make it more fun to follow a brand (Java et al., 2007). If no shout-outs are made, then the Twitter feed stays a feed that pushes out information and does not turn into a place where a two-way online communication takes place. After a closer look at the activities of the clubs on Twitter, it became apparent that FC Tokyo only used their Twitter account to push out news articles and other news flashes to the masses. Monterrey Rayados, on the other hand, tweet match updates and are not afraid to get in touch with followers. This requires more commitment on the human resources side, since a real-time conversation should be guaranteed, especially during matches. For one-way communication, social media management software such as Hoot Suite or TweetDeck can be used to schedule automated tweets (or Facebook updates etc. ), which can support the daily job of the responsible person for online communications. Nonetheless, the level of engagement from the club to its following is arguably the most essential factor to boost engagement from followers back to the club, and therefore, it is a crucial activity for a brand (Kreutzer et al., 2010). FC Spartak Moscow has published 268 YouTube videos since they started their channel on 7 July 2010. That is 53.39 percent of the 502 videos published among the three clubs, since the first of them joined YouTube in 2011. Monterrey Rayados follow shortly behind with 197 videos (39.24 percent) published since 4 October 2010. FC Tokyo published 37 videos (7.37 percent) since the inception of its channel on 20 July 2011. FC Spartak Moscow not only uploaded most videos, the club also gathered most subscribers (39,658/77.80 percent of the whole) and the highest amount of views on all uploaded videos (6,636,594/81.78 percent). The figures for the Monterrey Rayados YouTube channel amount to 8,962 subscribers (17.58 percent) and 1,268,443 total views (15.63 percent). FC Tokyo reached 2,352 subscribers (4.61 percent) and 210,041 total views (2.59 percent). However, FC Tokyo joined YouTube one year later than FC Spartak Moscow and nine months after Monterrey Rayados, which can have an impact on the number of subscriptions and video views. The level of engagement was assessed by analyzing likes and comments of the three most popular videos of each club’s YouTube channel, without considering dislikes, date of upload, and if the videos were restricted to specific regions. Even though FC Spartak Moscow outperformed both other clubs in the above-analyzed metrics, Monterrey Rayados gathered most likes on the top three videos with 2,070 likes (52.73 percent of the whole). However, FC Spartak Moscow was not far behind with 1,776 likes (45.24 percent). FC Tokyo was able to gather 80 likes (2.04 percent), whereas it is important to note that one (1) of their top three videos had the like-function disabled. In the case of comment-engagement, users who watched FC Spartak Moscow videos commented 2,310 times (69.45 percent), whereas Monterrey Rayados received 1,016 comments (30.55 percent). People were not able to comment on any of the top three FC Tokyo videos, because the club’s YouTube channel administrator disabled the comments function. According to Halvey and Keane (2007), the number of subscribers increases with respect to views and then falls off after a certain point. They also note that the number of subscribers that a YouTube channel has increases with the number of videos uploaded onto the channel. The correlation between the amount of subscribers our reference clubs have on their respective YouTube channels and the amount of total views also exists in our comparison. Hence, it is highly recommendable to upload a high number of videos to grow the subscriber base and generate more views. With more views more opportunity for commenting and liking is created. 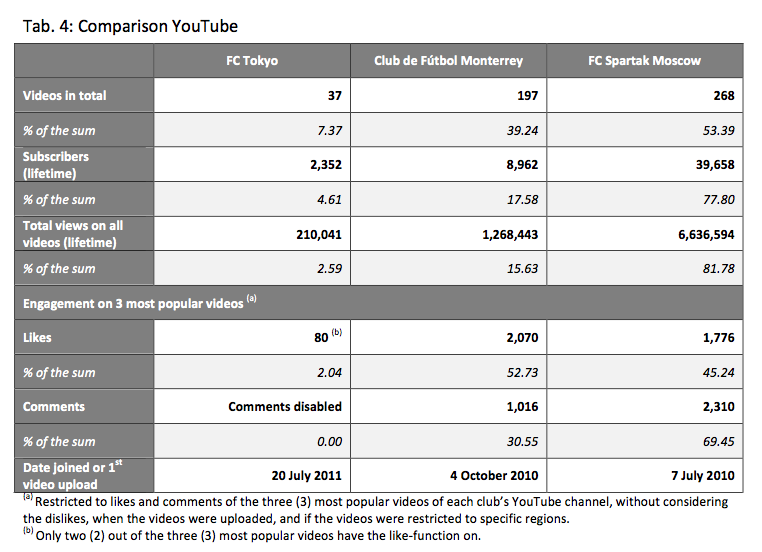 The metric that stands out most is the amount of likes given to the Monterrey Rayados videos, which is higher than the amount given to FC Spartak Moscow, despite all other Monterrey metrics being lower. A fair assumption could be that the top three videos of FC Spartak Moscow are less emotional and sparked less positive reactions than the Monterrey Rayados videos. Maybe they generated more dislikes; however, that is a metric not covered in this research. Three (3) football clubs from different continents with similar marketing and communication opportunities in their respective markets were chosen to assess their engagements and interactions with fans and followers on three social media platforms. The football clubs are FC Spartak Moscow, Monterrey Rayados and FC Tokyo, and the social media platforms analyzed for this research are Facebook, Twitter and YouTube. After deciding on a set of requirements, which had to be met by each club to qualify for the research, individual engagement metrics for each social media platform were elaborated and data was gathered for engagement levels in the time-span 15-25 March 2013. The nature of the engagement analysis on Facebook was based on how fans react to updates by the club on their respective Facebook fan pages. The analysis for Twitter engagement was based on how the club tries to engage with followers by retweeting, replying and mentioning other Twitter users. The nature of the engagement on YouTube was assessed by how many likes and comments the three most popular YouTube videos of each individual club have generated since their date of upload. There are two main findings in the Facebook analysis. Firstly, the research showed that there is no correlation between the amount of fan page-likes of our chosen clubs and fan-engagement. FC Spartak Moscow had 469,210 likes, but never reached more than 3.49 percent of engagement in comparison to the other two clubs, whereas Monterrey Rayados always reached more than 96 percent of engagement with only 213,220 page likes. The second finding is that there is a possible correlation between the amount of fan page posts and fan-engagement. Monterrey Rayados posted 84 percent of all posts across the three analyzed fan pages and received more than 96 percent of engagement across all measured metrics. FC Spartak Moscow published 10 percent of the posts and reached fan involvement of around 3 percent on all metrics. The Twitter analysis showed that the Monterrey Rayados account is the most active compared to FC Tokyo and FC Spartak Moscow. The Mexican club tweets more messages than the other two clubs and engages excessively more with its followers. Over the period of ten (10) days, Monterrey engaged in 120 tweets, whereas FC Spartak Moscow involved its followers in 31 tweets, and FC Tokyo not once. Many companies have realized by now that Twitter is a two-way communication tool used to engage stakeholders and spread one’s brand (Rybalko et al., 2010). According to this analysis, FC Tokyo uses Twitter as just another media channel to push out links to news instead of using it as a tool to connect with fans and people of interest. During the analysis of the three YouTube channels, it soon became apparent that FC Tokyo has a different attitude towards the platform than the two other clubs. All three most popular FC Tokyo videos have the comments option disabled and one of the videos has also the rating option disabled. This is a clear sign of communication block on the side of the club, which can disgruntle viewers. In addition, FC Tokyo has uploaded 37 videos, which generated 210,041 views. In comparison, FC Spartak Moscow and Monterrey Rayados uploaded 268 and 197 videos respectively, and generated 6.6 million and 1.2 million views. The research shows that the more videos are uploaded onto a YouTube channel the more users are to subscribe and the more video views are generated. It is therefore advisable to produce and publish as many videos as possible. In conclusion, we can say that Monterrey Rayados is the most engaging and dialogue-oriented club of the three clubs chosen for this comparison. They might not necessarily have the farthest reach in the first instance, but they are strong in building ties with fans and followers through dialogue and seem to be able to continuously engage them. FC Spartak Moscow is strong at gathering masses of fan page likers, subscribers and followers, but lags behind Monterrey when it comes to actual engagement. FC Tokyo is by farthest the least interactive club of our three reference clubs. By disabling communication options and not engaging with followers, information will not be carried onto the web and can therefore not reach people of interest. Communication can be looked at from a cultural point of view, and it might be argued that Mexicans are more outgoing than Asians, and it is therefore easier for them to engage in online dialogues. Such an analysis would be definitely of interest for further research and could give further insights into this matter. Yes, professional football clubs outside of Japan are more committed and engaged in interactions with fans and followers, because they use social media channels more often and more effectively. Nonetheless, further research is needed to assess the reason in more detail. Possible research could include an evaluation of the effect culture has on the communication behavior of clubs with a different cultural background, as well as a comparison of the engagement level of clubs from the same league. Brown, J., Broderick A. J., & Lee, N. (2007). Word of mouth communication within online communities: Conceptualizing the online social network. Journal of Interactive Marketing, Volume 21, Number 3, Summer 2007, 2-20. Delo, C. (2012). Japan Lags World in Social-Media Adoption | Digital – Advertising Age [Internet]. eBiz MBA. (2013). Top 15 Most Popular Social Networking Sites. Halvey, M., Keane, M.T. (2007). Exploring Social Dynamics in Online Media Sharing. Java, A., Song, X., Finin, T., Tseng, B. (2007). Why we twitter: understanding microblogging usage and communities. Kostalampros, K. (2013). How to Optimize Your YouTube Videos and Channel. Kreutzer, R.T., Hinz, J. (2010). Möglichkeiten und Grenzen von Social Media Marketing. Lange, P.A. (2008). Publicly Private and Privately Public: Social Networking on YouTube. Journal of Computer-Mediated Communication, 13. Lewis, T. (2013). YouTube superstars: the generation taking on TV – and winning. Munn, A. (2013). Why Your Likes, Shares & Comments are Worth their Weight in Gold | BMC Communities Blog. Mustonen, P. (2009). Social Media – A New Way To Success. Perez, S. (2012.) YouTube Reaches 4 Billion Views Per Day | TechCrunch. Rybalko, S., Seltzer, T. (2010). Dialogic communication in 140 characters or less: How Fortune 500 companies engage stakeholders using Twitter. Public Relations Review, Volume 36, Issue 4, November 2010, Pages 336-341. Scarborough. (2013). Engaging with Frequent Social Media Users. Selwyn, N. (2009). Faceworking: exploring students’ education-related use of Facebook. Learning, Media and Technology, Vol. 34, No. 2, June 2009, 157–174. Thaw, J. (2007). Google’s Schmidt Says Media Companies Need YouTube (Update3). United Nations. (2012). UN Stats—GDP/breakdown at current prices in US Dollars. Wilson, Z. (2013). Measuring ROI in Social Media Part III: Twitter Metrics | Confluence Digital Blog. Zhongju, Z. (2010). Feeling the Sense of Community in Social Networking Usage. IEEE Transactions on Engineering Management, Volume 57, Number 2, May 2010, 225-238.